On Saturday, I heard Joanna Rakoff talking on a panel at the Perth Writers’ Festival called “No Limits” with Hannie Rayson and Ros Thomas. Ostensibly, they were discussing the question “when it comes to writing about yourself, are some things off limits?”. Yet the compere declared at the beginning he wouldn’t ask the authors what they had left out of their books, as obviously they wouldn’t want to tell us. Rakoff’s My Salinger Year is an elegant memoir featuring a confessional yet elusive protagonist and narrator – Rakoff herself. Aged twenty-three in 1996, she spends a year working for a literary agency in New York. One of her tasks is to answer the fan mail for J. D. Salinger; he doesn’t want any passed on to him. She hasn’t properly left her college boyfriend, whom she had thought she would marry, but finds herself living with a posturing novelist/boxer named Don. Over the course of the memoir, she becomes aware of his true character and thus her own, as well as emerging as a poet and a small player in the literary world herself. Rakoff has crafted a superb narrative of her life; it is paced just right and has the satisfying plotting of a good novel. It’s this achievement which heightened my awareness of just how much she must have shaped her material (as any non-fiction writer must) and to what extent she had distorted, rearranged or amalgamated life. As in many memoirs, I’m left curious about what the other characters would say about the same events. Rakoff spoke briefly on the panel about those who would see her book as a betrayal, and about not wanting to hurt her boss, whom she depicts in all her eccentricity. It seems she feels she got the balance right. But there would be many stung, perhaps outraged by the book. And then there’s the elusiveness – it comes in the mysteriousness of her choice to move in with Don. It seems a mystery to herself, which makes it feel authentic; here it differs from a fiction plot – there is no attempt to neatly explain. These are the questions her memoir raises for me as a biographer. But I need to also make clear what a great book it is, engrossing and insightful. 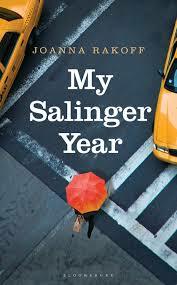 It’s about the publishing world, about New York, about why Salinger matters, and about being in your twenties.